At the heart of daily life in Taizé are three times of prayer together. The brothers live by their own work. They do not accept gifts or donations for themselves. Some of the brothers are living in small groups – “fraternities” - among the very poor. Taizé is not a "Christian" organization, although they claim to be. 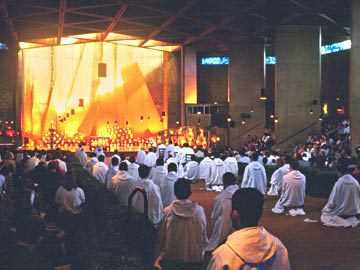 The Taizé "brothers" as they call themselves practice the Catholics false doctrine of the holy Eucharist. The doctrine of transubstantiation (digesting Jesus' blood and flesh) is nowhere taught in the Word of God, it is a pagan teaching. They also teach the damnable heresy that baptism is necessary for salvation. Baptismal regeneration is a lie of the devil. Through recited prayers and cultic songs, they worship in vain. I triple-dog dare you to show me the gospel plan of salvation on the Taizé website anywhere. As a matter of fact, I dare you to show me ANY plan of salvation on their lame website. The Taizé brothers do rightly call their community ecumenical, and might I add...straight out of hell. Only through Jesus Christ can anyone obtain the forgiveness of sins. Though the Taizé website does mention the death of Christ on the cross, the precious shed blood of our Saviour is nowhere mentioned. Heretic, John MacArthur, would be pleased. Taizé is just another wishy-washy organization, saying much without ever really saying anything. The world is filled with such false religions that speak great swelling words about religion, but there is little meaning or substance to their message. Love, love, love, but they never speak the truth. The truth is that hell is a place where unrepentant sinners will be tormented in the fires of brimstone for all eternity. Hell is real, and anyone who dies in their sins WILL be cast into hell just as was the rich man in Luke 16. I plead with you to repent of your unbelief and turn to Jesus Christ to be saved. Ye Must Be Born Again! Tired of living on ad hoc conversations with God, evangelicals and Charismatics are rediscovering the daily office. The place was overcrowded and noisy, and the food was unimpressive. Meals and meetings were held outside or in tents, depending on the weather. Visitors slept (and many snored loudly) in tents and overcrowded barracks. One had to stand in long lines (often up to 30 minutes) for everything, especially food. It hardly seemed like a setting for meaningful prayer, but my visit to Taizé turned out to be one of the most spiritually meaningful weeks of my life. Spiritual? If you call going to a wishy-washy, ecumenical, Catholic indoctrinated cult a spiritual event...then you need to either get saved or get your backslidden heart right with God. And not just for me. During the hot July week when I visited, Taizé welcomed more than 4,500 pilgrims, mostly young adults, from many denominations and from 60 nations (including a thousand from Eastern Europe). Summer weeks typically see between 2,500 and 6,000 visitors, with a total of 100,000 each year—although Taizé is off the beaten path (in France's Burgundy region, midway between Lyons and Geneva). What attracts so many to this place? When George Carey, the Archbishop of Canterbury, brought 1,000 youth in 1992, he was struck at how evangelicals, Catholics, and Charismatics all felt at home. Something is very WRONG when professed Christians and Catholics can all feel "at home." What fellowship hath light with darkness? I couldn't feel at home in a place like Taizé, I'd be street preaching or passing out tracts in their community. They'd throw me our real quick because I'd be teaching the Word of God, not some religious jibber-jabber. Like I said, show me the death, burial and resurrection (gospel) of Jesus Christ on their website. 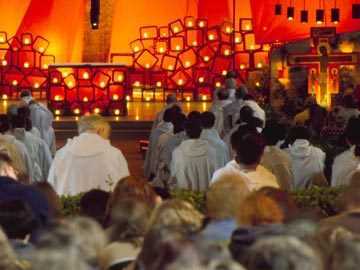 But the primary reason people flock to Taizé is the prayer and worship. "When you ask at the end of a week what they most appreciated. … seven, eight, nine times out of ten they'll say it's prayer, that they found something there," says Taizé Brother Jean-Marie, a native New Yorker. Yet it's a unique form of prayer that attracts; Taizé leaders call it "common prayer" and other Christian leaders call it the "the daily office," from the Latin officium meaning "duty" or "responsibility." This type of prayer brings people of all Christian traditions not only to France but also to increasingly popular prayer communities in England and Scotland, communities that structure their life together around the daily office. Any "type" of prayer (whatever that is) that yokes believers with unbelievers is of the devil. The Bible is adamant on this issue...born again Christians are to have absolutely NO tokes with the unsaved (such as Roman Catholics and the Taizé brothers). I recently had the opportunity to visit such communities at Lindisfarne, Iona, Taizé, and Northumbria, and I discovered that people of all denominations and no denomination have a continuing and lively interest in a Christianity that relies on the ancient tradition of common prayer. The term daily office refers to a variety of services of set prayers and readings that are said together through the day; in some places, this can add up to seven services a day. It is also variously called the liturgy of the hours, morning and evening prayer, or common prayer. As a practice it goes back not only to the early church but even to the Old Testament (see "The Rise and Fall of the Daily Office"). This pre-Reformation form of spirituality is now attracting attention in many quarters, including publishing houses. Note especially the unexpected success of Kathleen Norris's The Cloister Walk (Riverhead, 1996) and of the recording Chant by cloistered Benedictine monks in Spain. Intriguing literary variations on the office crowd bookstore shelves: Anita Barrows and Joanna Macy have translated Rainer Maria Rilke's poetic Book of Hours (Riverhead, 1996) and Phil Cousineau has edited a contemplative book called The Soul Aflame: A Modern Book of Hours (Raincoast Books, 2000). Bestselling author Gail Godwin's novel about an Episcopal priest not only reflects regularly on the office but also refers to it in the title, Evensong (Ballantine, 1999). Suzanne Guthrie reflects on the office in Praying the Hours (Cowley, 2000). Even my own Mennonite tradition is republishing old prayer books in spiffy volumes: Prayer Book for Earnest Christians (Herald, 1997) and Golden Apples in Silver Bowls (Lancaster Mennonite Historical Society, 1999), both edited by Leonard Gross. More than half a dozen noteworthy office books have been published within the last year alone, including Robert Benson's Venite: A Book of Daily Prayer (Tarcher/Putnam, 2000) and Robert Webber's The Prymer: The Prayer Book of the Medieval Era Adapted for Contemporary Use (Paraclete, 2000). Of all the new books, the most noteworthy is a three-volume office, The Divine Hours, edited by Phyllis Tickle (Doubleday, 2000). I understand the attraction. As a pastor and Christian, I have been especially concerned about the inadequacy of most Christian prayer for a culture in which many are formed by a weekly average of 28 hours of television. How about the inadequacy for professed Christians to realize that the Catholic Eucharist is straight out of the pits of hell, that baptismal regeneration is of the devil, and that Christians are to "Come out from among them, and be ye separate, saith the Lord..." It is a sin for any professed "Christian" to have any dealings with any heathen organization such as Taizé. I mean, it's a good indicator to me of the apostasy of our day when professed Christians are going to the heathen to learn how to pray...God help us!!! Too often, people who pray do so only briefly, without discipline or organization. They pray "on the fly," winging phrases toward God while commuting, or squeezing in an occasional devotional. Such prayers are ad hoc and self-directed: made up along the way, according to mood, and not paying attention to the Christian year. God wants prayers from our heart, not formal or "organized" prayers. God hates ceremonialism. Rather than having help, support, or direction from others with maturity or experience, many Christians decide on their own what to do. Maturity and experience? You've got to be kidding? You call yourself a "Christian," and you're going to the Taizé community to learn how to really pray? What's worse, Christianity Today actually endorses this crap. Yes, I said "crap." I call 'em as I see 'em. A horse is a horse is a horse. And Christianity Today should be renamed Apostasy Today magazine. Did you know that they also endorse Harry Potter. I commented enough on this ridiculous apostate article...Taizé is of the devil and every believer who names of the name of Jesus should depart from such wickedness. As a result, they find themselves increasingly disconnected and isolated from other believers. They are subjective; guided by their feelings of the moment, they freely abandon prayer modes (confession, praise, intercession). In the end, these Christians find themselves increasingly disconnected from God. This is part of my own prayer biography. In adolescence, I was reasonably disciplined in prayer until my sister, my only sibling, died of leukemia at age 17. This set off a huge faith crisis. At times I had nothing to say to God or did not know how to voice my prayers. About two decades ago, on a whim, I bought a discontinued book by a famous Catholic priest. As a convinced evangelical Anabaptist, I was skeptical. But I was also curious. As it turned out, this book became the starting point in my recovery of a fuller prayer life through the daily office. I've not been alone in this discovery, as my visits to a number of prayer communities quickly showed. "The holiest place in all of England"
My first stop was the island of Lindisfarne (locals prefer "Holy Isle"). Its small village includes several churches and three retreat houses—Lindisfarne is possibly one of the few places in Great Britain where retreat houses almost equal the number of pubs. Lindisfarne has been an important pilgrimage destination for centuries. From it sprang much of the early evangelization of England. Numerous Celtic Christian saints are associated with it, as is the gloriously illustrated Celtic manuscript, the eighth-century Lindisfarne Gospels. Alcuin, the medieval scholar and archbishop, once told Charlemagne it was "the holiest place in all of England." Today 140,000 people visit St. Mary Virgin Church (now Anglican) each year. As the island's oldest building, its architecture reflects Saxon and Norman influences, parts of it preceding the 12th century. Behind it lie the ruins of an 11th-century Benedictine monastery. St. Mary's also attracts visitors because its pastor, David Adam, is the popular author of more than a dozen books of Celtic Christian poem-prayers, including an office, The Rhythm of Life (Morehouse, 1996), which Adam wrote because so many people, including Anglicans, are unfamiliar with the office. Its short prayers and Scriptures can be memorized quickly, so those who use it can be nourished at all times and places. This office is getting around. Anglicans in the South American Andes are translating it into Spanish. Non-Anglicans elsewhere also use it, including a U.S. Navajo group and a group of Lapps in northern Finland. Adam says an office is like lined paper: "If you haven't got lines on the paper, you can't achieve much by yourself," he says. "That is true of most people: if they're left without an office, without prayers they learn and recite, they tend to pray very little." The office helps us pray when prayer is hard. He says that during spiritually dry or discouraging periods, "you've actually got this resource within you which you can call on. Even if you may have to say it quite coolly, you can still say it. I compare it to my wife's cooking: even when she's not that fond of me, she still cooks for me." Regarding the modern aversion to repetition, he says, "It's really hard to get people to see that what you're dealing with is something of tremendous depth, and the words are just plumbing the depth. It's. … like turning a drill. It might appear boring, but the more you are turning the deeper you get. It's literally boring. But if you only turn it once you don't get very far. "I suppose most folks who don't like repetition never say 'I love you' to their wife more than once in their life," Adam says, laughing. But Adam recognizes obstacles: "Offices were written for people who had a more leisurely start to their day. Nowadays most people set an alarm, jump up, and travel miles and are in a hurry. The office says. … 'Slow down, take your time. Make some space.'" Another problem is finding times and places to meet with others. The office requires community: "Any office by yourself for long is difficult. Even if you share the office once or twice a week, you can manage it the rest of the time by yourself—as long as you have this sharing," Adam says. Adam has a pastoral and missionary concern for island neighbors and the visitors who come from all over the world. He meets many and offers counsel, support, and advice. Adam's ministry confirmed something I saw in each community: people are drawn to prayer and a community rooted in the office. Iona is a small Hebridean island off Scotland's west coast. Columba, an Irish monk, landed there in the sixth century, setting up a monastery that evangelized much of Scotland, England, and Europe. A burial place of many Irish and Scottish kings, the monastery is known for a beautifully illustrated Celtic manuscript, The Book of Kells. The sense of history is reinforced by the ancient gravestones and standing stone crosses (one is more than 1,000 years old) found on the island. Samuel Johnson once wrote that a person "is little to be envied whose piety would not grow warmer among the ruins of Iona." It is a stunning place with stark hills, huge boulders, snow-white beaches, and many-hued waters. In the 1930s, Church of Scotland (Presbyterian) clergyman George MacLeod gathered seminary students and tradesmen to rebuild the ruined medieval Abbey. This project, which was designed to help ministers understand working folk and to train working folk in theology, was the beginning of Iona Community. Now with more than 200 members from many denominations, and growing steadily, the community has a strong commitment to peace and justice and is known for its worship resources. Its island conference centers are so popular that reservations must be made months in advance. The abbey sees more than 100,000 tourists per year (sometimes up to 1,200 a day). This is especially impressive since it is no mean feat to get there: from Glasgow, one must take a train, two ferries, and a bus that crosses the Isle of Mull on a one-lane road. People joke that it is easier and quicker to get to Spain. I stayed a week at the abbey. Guests, staff, and volunteers from around the world represented many denominations. In addition to daily morning and evening prayers, there was strong emphasis on community and chore-sharing. (Each day I proceeded from morning prayers to clean toilets while humming hymns.) Worship and work are integrated. Morning worship never ends with a benediction—as work is part of worship—and the evening service never begins with a call to worship, since it is an extension of work. Worship was lively and inspiring. We said the Lord's Prayer rhythmically, phrase by phrase, each line echoing against the stone walls like the waves beating on rocks a few hundred feet away. Our singing included praise choruses, hymns, African-American spirituals, monastic chants, and international Christian music—all with the magnificent acoustics of the rebuilt medieval church. Iona encouraged prayer in many ways. The main church has a special corner for intercession and healing, and Iona offers a healing service once a week. The abbey had other chapels dedicated to prayer. In the main church, a little shrine calls to mind "all victims of violence in the world and those who stand with them." One transept, behind a screen donated by Queen Elizabeth, is filled with displays about a host of social and political movements, including human rights (Amnesty International), international debt relief (Jubilee 2000), and opposition to land mines. Iona believes that worship needs to be incarnational, engaged with daily life, and historical, rooted in Christian traditions. Daily prayer—even if not in a shared space—is important for holding the dispersed community together. "Whatever our mood, whatever our circumstances, there's a given," says Norman Shanks, Iona's leader. "If you like, it is a gift." That gift gradually transforms Christians, he adds, helping us at all times to be still, silent, and open to God and others. Brian Woodcock, a United Reformed pastor and Iona's warden (administrator), is concerned for those with little church connection and finds it important to emphasize the Bible in every service. Youth often comment that the services are not "boring" like some church worship. Often people who do react to the repetitiveness early in the week welcome the rhythm by week's end. A perennial problem for retreat places is that "mountaintop experiences" do not connect with life. Woodcock says worship needs to help people remember that "if we come away in order to find God, in the end it isn't God that we're finding." Withdrawal must always have the purpose of changing our perspective and helping us engage where we live, work, and minister. Several times I heard a wry quote: "People come seeking peace and quiet, and we try to send them away seeking peace and justice." Shanks said that Iona involves "renewing, reconciling, living, and exporting the gospel in engagement, not withdrawing to the margins of a ghetto or a supposedly peaceful place." As visitors are told before afternoon prayers: "The gospel commands us to seek peace founded on justice." The most difficult thing about prayer is its challenge. "If one takes the actual words quite seriously, some of it is quite hard," Shanks says. "The God reflected is a God whose love is compassionate and steadfast but also tough. The morning office promises, 'We will not offer to God offerings that cost us nothing.'" At Taizé, the only impressive building is the church. A Methodist minister told me that Taizé looks "like a refugee camp built around a church." ("Refugee camp" is appropriate since it seems that people came to Taizé seeking refuge from a secular and materialist culture.) For one older woman, the camping, food lines, and crowds brought flashbacks of her internment in a World War II concentration camp. Each day is organized around three worship services—morning, noon, and evening—each lasting an hour. People sit or kneel in a darkened room, facing ceiling-to-floor banners, hundreds of flickering candles, and icons. Music is led by an unseen song leader and a volunteer choir. Each service is a series of Taizé chants, short Bible readings (especially Psalms and Gospel readings), prayers (translated into four to six languages), and a prolonged silence of five to ten minutes (no mean feat with thousands of youth). This is a far cry from the beachball pyrotechnics at our denominational youth events. The emphasis is on simplicity (especially necessary given different language groups and church traditions) and evoking mystery and reverence. The singing was so beautiful that for the first time in my life I was attracted to the idea of singing in heaven for all eternity. When the evening service ended at 9:20, many opted to sing and pray for hours more, often past midnight. People still lingered at 1:30 a.m. after the weekly Friday-night vigil. In addition, the day includes hour-long Bible studies (also translated into many languages), chores, and common labor—not your typical holiday jaunt. Many people return year after year. Months after my visit, some of those who have kept in touch with me continue to speak about how the week was a turning point and marked a deeper commitment to prayerful service. Roger Schutz-Marsauche (now Brother Roger) founded Taizé during World War II. Coming out of a Reformed background, he hoped to create a small, prayerful community to reconcile Christians. As more and more visitors came, the brothers responded to the spiritual hunger. In response to the influx of youth, the community simplified its traditional monastic worship, using short texts, prayers, and repetitive chants. Of all the communities I visited, Taizé is the most radical in its willingness to revise its daily office; indeed, Taizé leaders no longer use the term office and prefer common prayer. "That's one of the concerns here," Brother Emile says, "that people can quite quickly understand something of what's at the heart of the Christian mystery. If they understand that, then they'll want to go further, start to ask questions: How can I deepen the faith? How can I get to know the Scripture more? That has guided a lot of what we do here." The least famous place I visited was where I felt most at home, at the Northumbrian Community. Its symbolic center is Hetton Hall, an old, rambling house in remote, rural northern England, built around an 13th-century tower. The publishing giant Harper got hold of Northumbria's office several years ago, and sought permission to publish it. Celtic Daily Prayer (Harper, 1994) has sold well and people have come from as far away as Tasmania and Russia to visit because of it. Northumbria is surprised at the wide response. While I was there, middle-aged and elderly women were attending an art retreat led by "Christian Goths." Recent guests and volunteers include people from the United States, Canada, France, and Australia. The community property includes a prayer chapel and two poustinias (outdoor prayer cells). The community prays together four times daily: morning, noon, evening, and before going to bed. Singing includes hymns and choruses. The services have a set structure but include times for spontaneous sharing and intercessions. Conversations included references to Youth With a Mission, Youth for Christ, Baptist churches, the Vineyard movement, spiritual warfare, and Spring Harvest (a major annual evangelical festival). At the same time, there are icons everywhere and crossing oneself is a regular part of prayer. The community is enriched by all Christian traditions. Richard Foster "believes our community is a living embodiment of his book, Streams of Living Water," says Trevor Miller, one of the community's two leaders. Members spoke of their "new monasticism." Like the other communities, they feel a call to minister to those who feel estranged from the established church. Northumbria members put strong emphasis on intercession. I was a beneficiary. While at Northumbria, I learned that a good friend in Canada—a 45-year old husband, father, and psychiatrist—had been hit by a car and was on life support. Community members prayed for him, his family, and me. A middle-aged mother of teenagers said she appreciated the emphasis on "grace and struggle" since "triumphant and victorious living" rhetoric was no longer helpful for her. A Baptist member found liturgical worship foreign, but saw that it affirmed God's presence in new ways and involved "other truths I need to hear." She appreciated the connection with other Christian traditions. David Ward, a charismatic evangelical pastor, wrote for a Northumbria newsletter about his discovery that the daily office gives more depth to his prayer life and functions as a school of prayer. Community member Rob Brown told me that even nonliturgical people find "anchors" in the office: "For people in deep struggles, to have something that happens every day at the same time, it's like a skeleton that keeps them from falling to pieces." The daily office is not easy and it will not solve all problems. As Brother Emile says, "No matter how beautiful a prayer is, there's always going to be a need for perseverance, for commitment, for being faithful. There will be times when we don't feel the beauty. Then we pray the question rather than what we feel." But even and especially then, Emile notes, we need to pray together: "People are not going to be able to persevere alone in personal prayer. In regular common prayer, you join together and take your part. Discouragement is too easy today. But in common prayer you support one another. We are never all at the same place. … This week I support you and next week I need your support." The point is not a new works righteousness or meaningless formality. Rather, this practice can provide a way of prayer that will help some—perhaps many—pray. St. Benedict wrote of singing Psalms "in such a way that our minds are in harmony with our voices." The daily office can integrate life and prayer in just this way. Or, to paraphrase a great old hymn, this might just be the way for God to "take our moments and our days; [and to] let them flow in ceaseless praise."